If you happen to be on Fire Island over the summer, look out for this event on the Ocean Beach Marina. 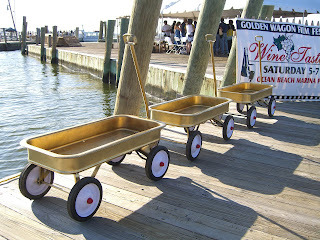 For the past two years, the tasting has raised money to support the annual Golden Wagon Film Festival. While the event previously featured only Long Island wines, this time half were Italian. I enjoyed two refreshing proseccos and a full-bodied Montepulciano, among less successful offerings. The Long Island wineries featured were Borghese, Paumanok, and Pindar. The Paumanok stood out. They had a good, light-bodied Chardonnay, as well as a rich and earthy 2004 Cabernet Sauvignon--the best wine of the tasting. In addition to wine, there was an assortment of interesting cheeses, including brie, St. Andre, goat cheese, layered cheddars and more. Live guitar music was a nice touch. 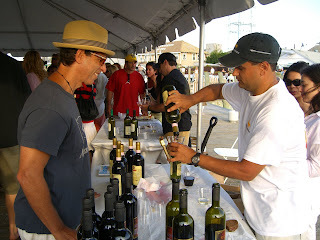 While I think the event should include more Long Island wine and the pourers should have information about what they’re offering, the event is a nice departure from the usual weekend activities at the shore. The two hour tasting drew a large, amiable crowd of casual imbibers and wine lovers. As my friend and I sat on the marina, we savored the Paumonok cab and some pungent cheese as we watched the ferry sail by. It was a lovely evening all around. Welcome friends & loyal readers (Joli) to the second version of my wine blog, now with a URL that's easier to type. 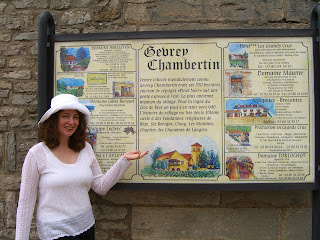 Spring was my France fling, off to the gorgeous countryside of Burgundy. It was amazing, a veritable wine mecca. In the wine capital of Beaune it's easier to find a wine shop than an ATM. Beaune is a well-preserved town with a hodge-podge of buildings dating from the early to late middle ages and into the 19th century. It's also the site of a world-renowned wine auction, a bustling affair that raises hundreds of thousands of dollars for good causes. The event takes place at the Hospice de Beaune. Created in 1443 by a naughty chancellor looking to set things right with his maker, the Hospice de Beaune is basically a cathedral, complete with elaborate altar, but with hospital beds lining the walls. All of this posh luxury was reserved for the poorest of the poor, who would spend their final days attended by loving nuns. Taking a tour of the hospice, we saw the well-preserved apothecary, where tall shelves were packed with strange powders and dried herbs that were used to create healing brews and poultices. In the courtyard, you can see the second main building of the complex, which is topped by a roof of breathtaking Flemish tiles. But on to the wine. From Paris, our first stop was Chablis. Now, those of us around in the 70s remember Chablis as a jug wine you could buy from Ernest & Julio Gallo. I have fond memories of a friend's mother enjoying a few glasses each night before tucking off for bed. IT'S NOT THAT CHABLIS! The true, original and only Chablis comes from this tiny French town. It's a crisp dry chardonnay with a good balance of fruit and acidity. Looking on the hilly terraine, I saw large white rocks resting under the vines. Wandering around the town on a sleepy Sunday afternoon, I nearly despaired of tasting any wine. Then I spied an old man out in his courtyard. In French, I told him we were American tourists hoping to taste some wine. Never underestimate speaking some of the native tongue! He beckoned us into his stone house to his first-floor tasting room. There he poured four Chablis, including a Grand Cru, and told me (in French) about the limestone rocks and fossilized snail shells as big as melons that add the mineral flavor to the wine, making it taste different than the Chardonnay of the Macon region in southern Burgundy. 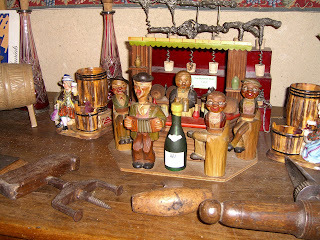 After the tasting, he let us wander around in his corkscrew museum, with an amazing assortment of "tire-bouchons." Some were huge mechanical contraptions, many were whimsical, and some were, uh, anatomically interesting: an array of monks, little boys, and other carved males with the screw strategically placed.